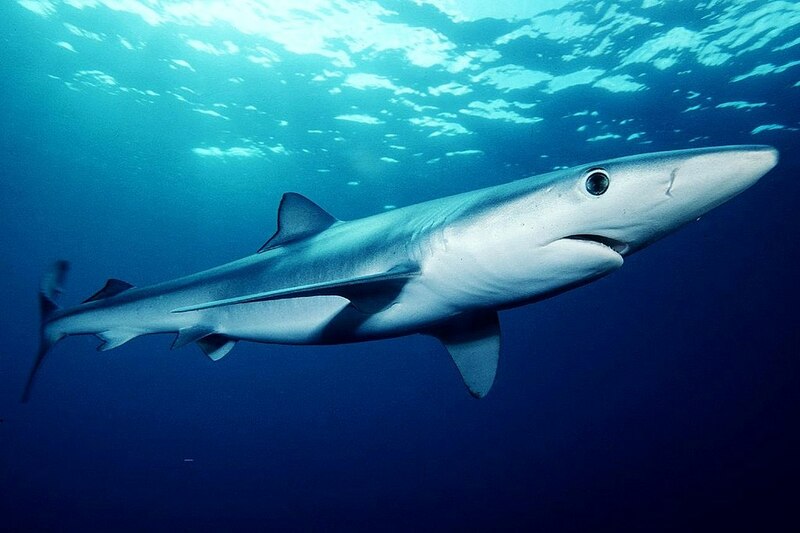 Blue shark (Prionace glauca). Photo by Mark Conlin-NMFS, Wikimedia Commons. A new study published in Marine Policy reveals that 97 per cent of the sharks and rays caught and brought to market domestically by fleets from the European, North African and Middle Eastern countries that surround these seas are not reported by species. Fishing spheres. 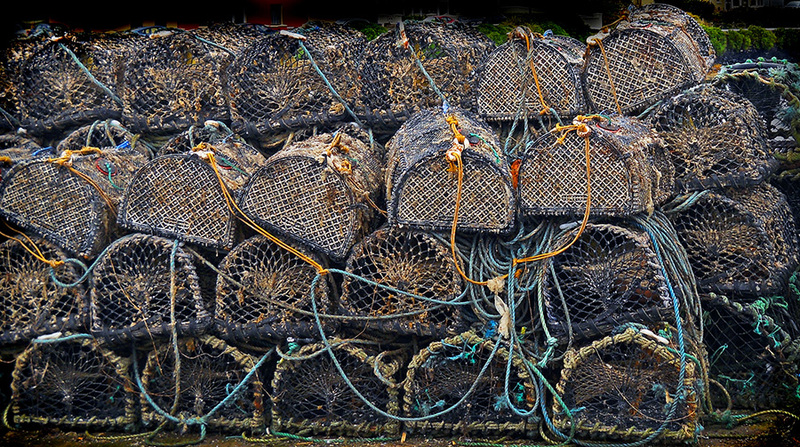 Photo by Psyberartist, Flickr, CC BY 2.0. 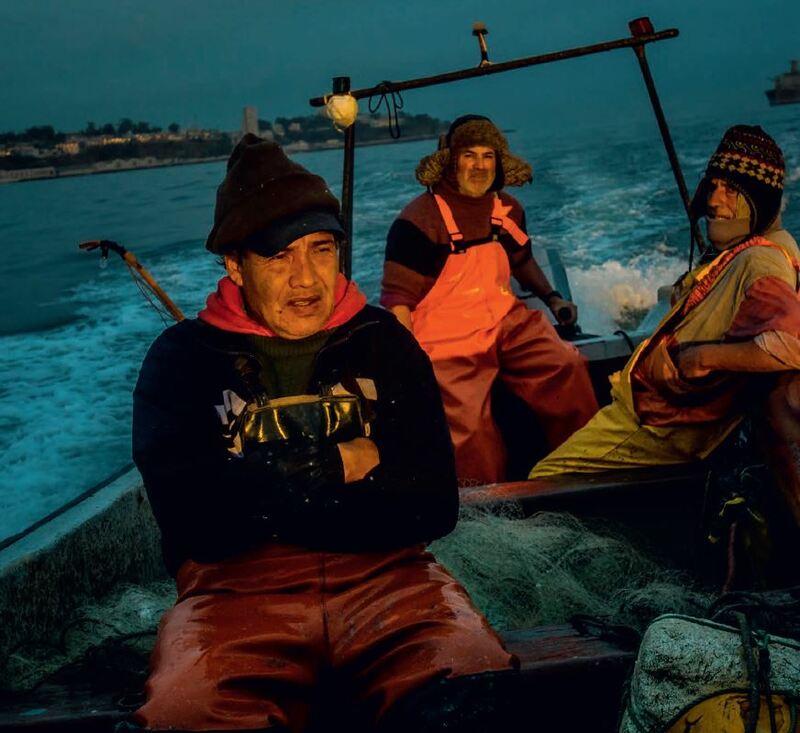 The Sea Around Us’ Project Manager, Deng Palomares, and Principal Investigator, Daniel Pauly, published an editorial in the journal Frontiers in Marine Science highlighting the importance of a long-term perspective when evaluating the status of fisheries. Dirk Zeller and Daniel Pauly. Photo by Alison Barrat. 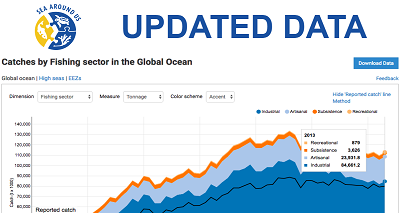 For the first time in over 10 years, the Food and Agriculture Organization of the United Nations (FAO) acknowledged that catch reconstructions, such as those carried out by the Sea Around Us for every maritime country and territory, help fill gaps in national fisheries data and, thus, can illustrate how catches have really changed over time. In response to this acknowledgement, which appeared in the bi-annual State of World Fisheries and Aquaculture report, known as SOFIA, Daniel Pauly of the Sea Around Us at the University of British Columbia, and Dirk Zeller of the Sea Around Us – Indian Ocean at the University of Western Australia, published a short comment in Marine Policy welcoming what they see as a positive step by FAO in the quest of providing better fisheries data to the global community. Humanity and the way we feed, fuel and finance our societies and economies are pushing nature and the services that power and sustain us to the brink, according to WWF’s Living Planet Report 2018. The report, released today, presents a sobering picture of the impact of human activity on the world’s wildlife, forests, oceans, rivers and climate, underlining the rapidly closing window for action and the urgent need for the global community to collectively rethink and redefine how we value, protect and restore nature. The Living Planet Report 2018 presents a comprehensive overview of the state of our natural world, twenty years after the flagship report was first published. Through indicators such as the Living Planet Index (LPI) provided by the Zoological Society of London, the Species Habitat Index (SHI), the IUCN Red List Index (RLI), the Biodiversity Intactness Index (BII) and the Sea Around Us fisheries data, as well as Planetary Boundaries and the Ecological Footprint, the report paints a singular disturbing picture: human activity is pushing the planet’s natural systems that support life on earth to the edge. The Sea Around Us’ Daniel Pauly and Dirk Zeller have just added a new publication to their long list of items in the literature. In this case, it is a chapter in the recently published book World Seas: An environmental evaluation. Vol. III: Ecological issues and environmental impacts, edited by Charles Sheppard. In “The making of a global marine fisheries catch database for policy development,” Pauly and Zeller give a detailed account of the process of creating the Sea Around Us’ global catch database that builds on and addresses the deficiencies of the database created and maintained by the Food and Agriculture Organization of the United Nations.